Chimney Rock NC is a vacation village developed to accommodate guests visiting the unique wonders of Chimney Rock Park. It includes the picturesque Rocky Broad Creek meandering parallel to the Village through Hickory Nut Gorge. Chimney Rock NC connects to Lake Lure in only minutes via "Memorial Highway". Chimney Rock Village offers souvenir and specialty shops, casual dining and family-friendly fun. Located in between Chimney Rock and Lake lure - 2 cottages and 3 log cabins offer deck, jacuzzi, fully equipped kitchen, AC - immaculate and professionally decorated. The Esmeralda Inn - 14 guest rooms, some with mountain views and balcony. WIFI, outdoor stone jacuzzi, onsite dining, Specials and packages offered, Events facilities. Onsite restaurant. Fibber McGee's Riverfront Inn - 9 guest rooms and suites with WIFI, some with riverfront balcony, jacuzzi bath, fridge. Full breakfast and afternoon "goodies" included. Located on the Rocky Broad River in downtown Chimney Rock Village. Chimney Rock State Park Standing atop the Chimney Rock, a 500 million-year-old giant granite monolith overlooking Hickory Nut Gorge, visitors are awed by the breathtaking view that spreads 1200 vertical feet beneath them and 75 miles across the Carolinas. The state-owned park, located in Chimney Rock North Carolina, encompasses 1,000 acres, including the Chimney itself and Hickory Nut Falls and the beautiful Hickory Nut Falls. 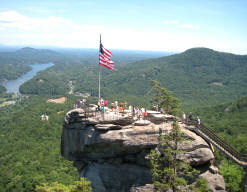 Chimney Rock Park is a "must see" for any trip to the mountains. Hickory Nut Gorge - Rushing waters, rocky cliffs, a giant waterfall and pristine forests make Hickory Nut Gorge a popular destination for hikers, leaf-peepers and photography buffs. Over eons, the Rocky Broad River has cut through the mountainous terrain to create the 14-mile gorge, which drops about 1800 feet between the town of Gerton and Lake Lure. Chimney Rock Gem Mine & Jewelry Co.